Walt Disney still knows how to make a good animal-adventure action yarn, and they prove it with WHITE FANG, a picture based on the classic John London novel, filmed entirely amid the breathtaking scenery of Alaska. The story takes place in 1898 and tells about Jack Conroy, a San Francisco boy who comes to the harsh Alaskan wilderness in a dangerous search for his father’s gold mine. The young explorer meets his father’s buddy Alex Larson, a rugged guide who agrees to take Jack to his father’s claim. They set out by dog sled, and we soon see that a half-dog, half-wolf is slipping in to their campsite at night to swipe fish for a pup she is mothering nearby. When wolves attack and kill the mother, the pup is left to fend for itself. Jack and Alex reach a town where they plan to winter. A band of Indians, meanwhile, find the pup, and the chief names him White Fang. As Spring comes, Jack and Alex resume their quest, but stop off at the Indians’ settlement. The chief explains that the half-dog, half-wolf has been raised to obey, not be friendly, but Jack seeks to change that. Jack’s chance comes when he is chased and trapped by a grizzly. White Fang intervenes, and Jack returns the favor with a tasty treat, which begins their friendship. White Fang, however, is later trapped by an unsavory lot, who teach the wolf/dog to be mean so that it will win gambling money in illegal dogfights. White Fang eventually meets his match in a brutal bulldog, but now it is Jack who intervenes in the nick of time. Having earlier reached his father’s claim and begun the work of digging for gold, the boy returns with the wolf/dog to the cabin where he seeks to transform White Fang’s nature. 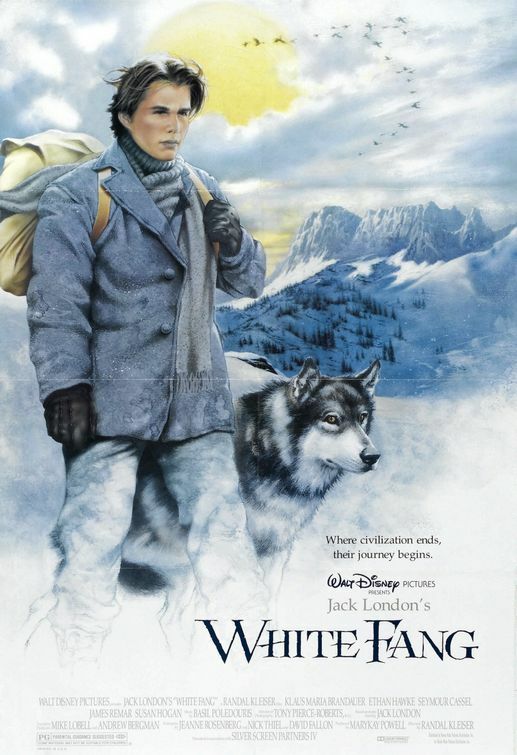 If you like dogs (huskies, malamutes, and St. Bernards) and the lessons Disney provides in films like these, lessons about responsibility, love and loss, you’ll like WHITE FANG. Indeed, the film’s theme is that dog as friend is better than dog as simple obeyer. The action is well-edited and handled tastefully, in that sweet-natured moments, such as cuddly affection, are balanced with moments of real-life in the wilderness that are not so nice. Yes, Disney sure knows how to capture God’s creation on screen, which in itself is enough to draw moviegoers to WHITE FANG. It could have stood on its own as a G-rated picture, but due to the presence of 9 obscenities (7 of them “damn”), the movie is rated PG. If you like dogs and lessons about responsibility, love and loss, you'll like WHITE FANG. The action is well-edited and handled tastefully. Yes, Disney knows how to capture God's creation on screen. It could have stood on its own as a G-rated picture, but due to 9 obscenities, the movie is rated PG.